What a wealth of choices! We remember the days when the only places to eat after 10 p.m. were Dennys and Waffle House. 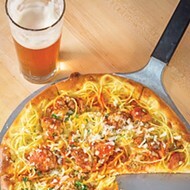 Next time youre out late with friends, check out OKCs abundance of local late-night eatery options. 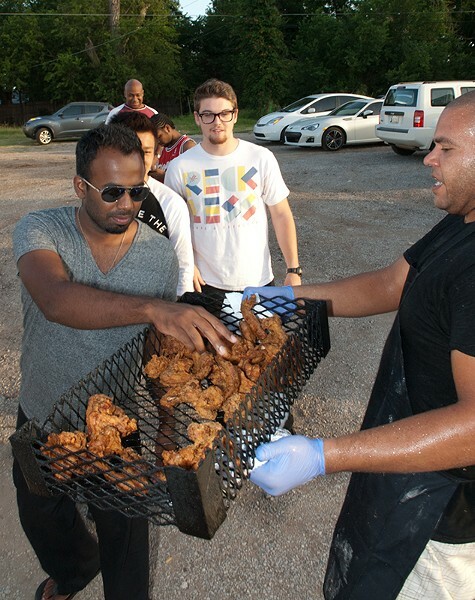 Sherron Bennett passes out free samples fresh out of the fryer to patrons waiting in line for Bobo's Chicken. Bobos Chicken 1812 NE 23rd St. Some things dont change, and in Bobos case, that is definitely a good thing. Its open very late  or should we say very early? It could change how you feel about fried chicken. At Bobos, its smoked and then fried, a delicious combination. A good party tip: Always get the honey sauce. Open through the wee hours, or when the truck runs out of grub. Bone marrow - one of the late night menu items at Ludivine. Chefs Jonathon Stranger and Russ Johnson, the dynamic duo behind Ludivine, are concerned with real food. With that in mind, they keep the kitchen open late  late enough for you to remember you only had that sandwich, like, seven hours ago and, man, you could totally go for some sustenance. 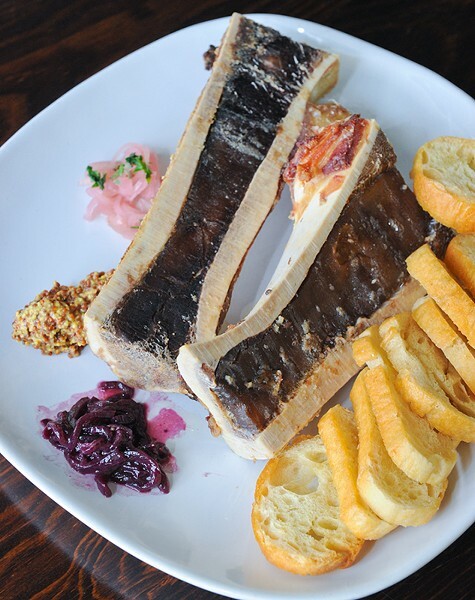 Go out on a limb and try the bone marrow. 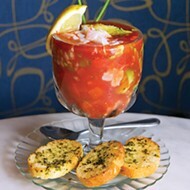 Restaurant open 5 p.m.-10 p.m. Tuesday-Saturday. The bar is open 5 p.m.-midnight Monday-Thursday and 4 p.m.-2 a.m. Friday and Saturday. 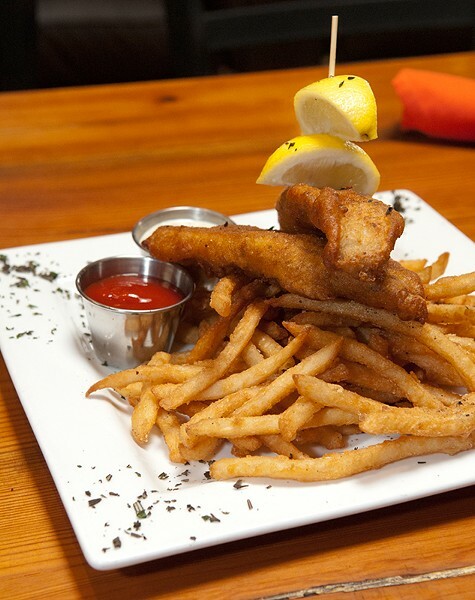 Old-Style Beer Battered Fish & Chips at Picasso Cafe. 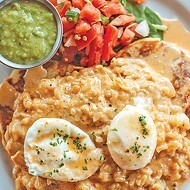 Whether you prefer the funky nostalgia of Picasso Cafe or the dimly lit booth space of The Other Room, you can get at least some of its menu almost anytime. The beer-battered fish and chips are excellent, and theyre on the late-night menu to satisfy that salty, fried craving with some actual nutrients. Both are locally owned by Shaun Fiaccone and Kim Dansereau. Open until midnight Thursday and 2 a.m. Friday and Saturday. 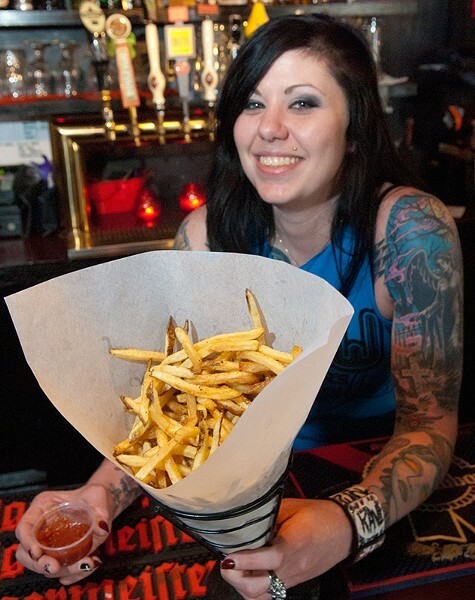 Staff member Jolie Foster with Drunken Fry's belgian fries and sauce. Good booze, import beers and salty, perfect French fries  whats not to love? With over 50 sauces to choose from, youre sure to find one to break through the alcoholic haze and get you back on track to party. It also has a serious beer menu. 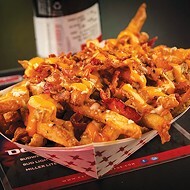 Get some recommendations and try a few as a complement to your fries. It also has PBR (Pabst Blue Ribbon) on tap, if thats your kind of thing. 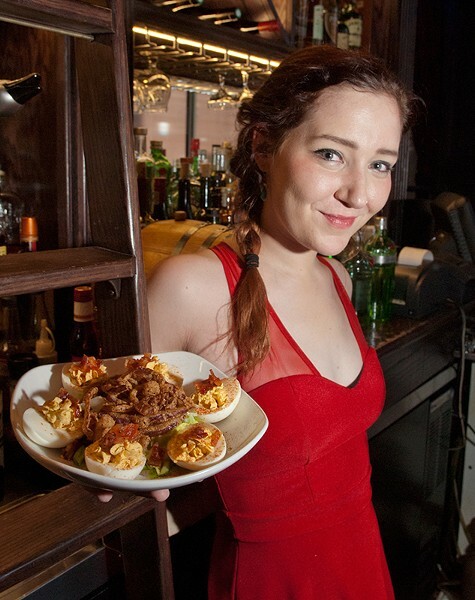 Taylor Hutchensin with Deviled Eggs at WSKY Lounge. 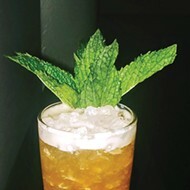 Open late, with a staggering selection of scotch and whiskey, WSKY also has one of the most sophisticated bar menus in town; no frozen chicken wings here. The bacon-wrapped dates are little candies of perfection, and the deviled eggs make you understand why deviled is the descriptor. 2 tacos basket at The Garage, 1117 N. Robinson Ave., in Midtown OKC. The Garage has some damn fine burgers, and you can get them until 10 p.m Sunday-Thursday and 11 p.m. Friday- Saturday. With that said, its late-night menu features great tacos, and its creamy onion dip is a grown-up take on a picnic favorite. You could even do your body a favor and order a salad. 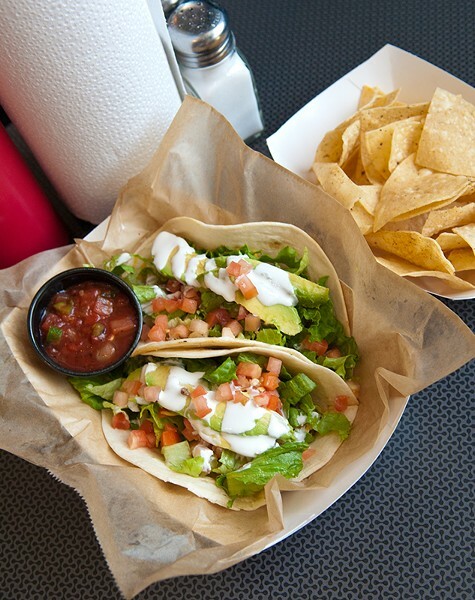 Get apps, sides and tacos after 10 p.m. on weekdays and after 11 p.m. Fridays and Saturdays. 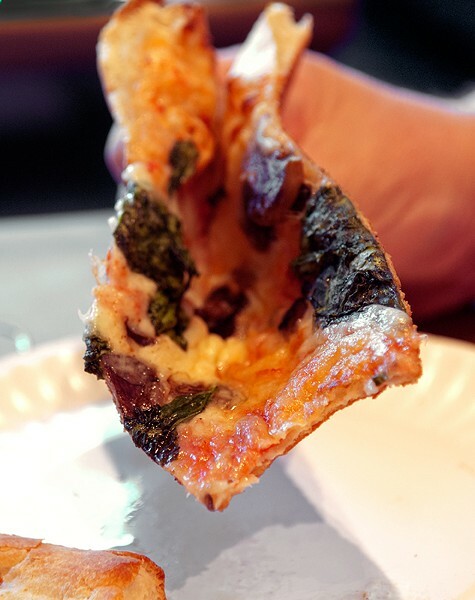 Open until 2 a.m.
A customer folds his big floppy slice of Fungus Among Us for eating, at Empire Slice House. Its never too late for pizza. Well, you do have to get in under the wire of bar-thirty in OKC, but Empire Slice serves its delicious pizza by the slice until closing time each night. 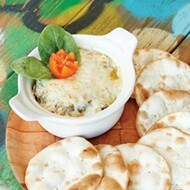 Grab a slice while you sit on the patio, or grab a few to take with you and be the hit of any party.